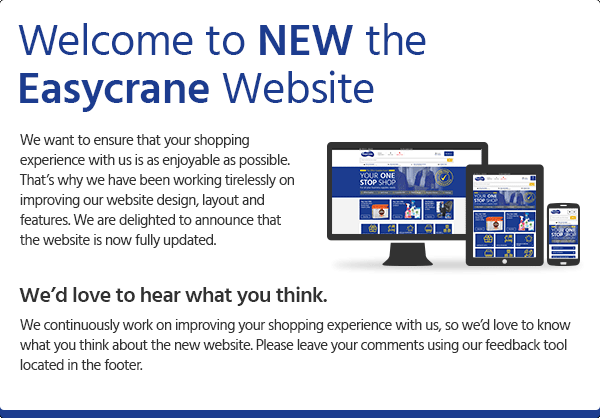 1.2 From time to time on www.easycrane.co.uk(the “Website”) we run promotions. 2.1 From time to time we may offer free gift promotions on the Website. In order to claim a free gift you must quote the relevant gift code when placing your online or telephone order. When shopping online, please enter the promotional code in the ‘Coupon Code’ box in your shopping basket and follow the on-screen instructions. 3.4 Web-coupons cannot be exchanged for cash or be used to purchase gift vouchers. 3.12 Web-coupons distributed or circulated without the written approval of Easycrane Ltd, for example on an Internet message board or on a "bargains" website, are not valid for use and may be refused or cancelled. 3.13 When you use a web-coupon you warrant to us that you are the duly authorised recipient of the web-coupon and that you are using it in good faith. 4.1 We mark products which qualify for discounts as “Discount Applied” next to the price in your shopping basket, products which are not specifically identified “Discount Applied” are not eligible for further discounts. 4.2 Where an online offer states that a percentage discount will be given on a purchase, the cost of the qualifying purchases will be reduced by the stated discount percentage. be discounted unless specifically stated in the promotion description. 5.3 Employees of Easycrane Ltd, their subsidiaries or affiliated entities and their immediate family members are not eligible to enter prize competitions. 5.7 The winner may first need to qualify for the competition by passing a skill, judgement or knowledge test in accordance with the rules of the specific competition, the winner will then be chosen at random from those Participants who have successfully passed the skill, judgement or knowledge test (the “Winner”). The chances of winning a prize depend on the number of qualifying entries received by us prior to the closing date. Our decision is final and no correspondence will be entered into. 5.8 A Winner will receive the prize detailed on the competition entry page (the “Prize”). The Prize is non transferable. There is no cash or other alternative. We reserve the right to substitute a Prize of like value in the event that the awarded Prize is unavailable for any reason whatsoever. 5.9 Winners of the competition will be notified by e-mail as soon as reasonably practicable after the competition has ended. Prizes will either be emailed to the Participant’s registered email address where the prize is a non-physical digital item (such as a web coupon), sent to the Participant’s registered address or where the prize consists of rewards points, credited to the Participant’s reward points account. 5.10 Winners of the competitions may be displayed on the web site in the format title surname area e.g. Mr Jones from Birmingham. You hereby consent to this use. If the winners of a competition are not displayed on our site, you may request a list of winners by sending us a self-addressed envelope, within 30 days of the date of the competition closing. Please may sure that your request properly identifies the competition that you are enquiring about as we may have more than one competition running at the same time. The winners list will be sent only after the prizes have been awarded. they have accepted these Terms and Conditions. 5.14 We reserve the right to cancel the award of the Prize at our sole discretion without prior notice if the Prize cannot be delivered to the postal address indicated by the Winner and is returned to us. 6.1 This promotion is carried out by Easycrane Ltd, (Company No. 04612434; VAT No. 805 415 943) and our registered office is at Unit 23, The IO Centre, Armstrong House, Royal Arsenal, London, SE18 6RS. 6.2 This offer is only available to residents of Great Britain and Northern Ireland. Only end user customers based in Great Britain and Northern Ireland are eligible to claim Cash back in this promotion. 6.3 Products returned for credit within the 14 day returns period may reduce your category spend below the required minimum spend. 6.4 Upon purchase of the product, the amount of money due to the participant in the promotion will be issued within 21 working days. 6.5 Payment can only be made to the person identified in the customer account section as being the billing contact. 6.6 A maximum total of one cash back offer can be claimed per customer, per promotion. The cash back amount is VAT inclusive. 6.7 To the fullest extent permitted by law, we shall have no liability whatsoever to any participant in this promotion in respect of this promotion. 6.8 We reserve the right to withdraw this offer or alter these terms and conditions or the amount of cash back available at any time without providing notice. 6.9 In the event of the offer promotion withdrawn payments will only be honoured for applicable purchases completed prior to removal of the offer. 6.10 This promotion cannot be used in conjunction with other promotions.